There’s a new gourmet coffee and chocolate shop in New York City….2|Beans. It’s a high-concept, European-style shop and the premier New York City destination for high-quality, hand-selected chocolates from the United States and around the world. Imagine that perfectly delectable, melt-in-your-mouth piece of chocolate paired with an expertly prepared cup of cappuccino in a warm and inviting coffee bar environment. 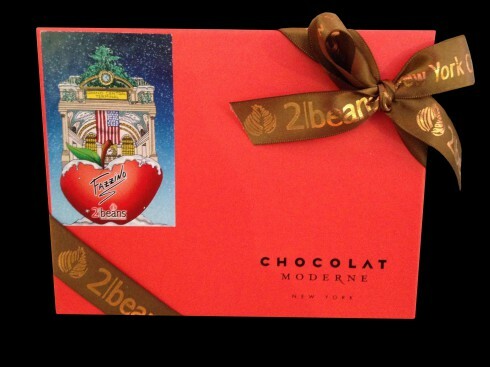 That’s what you can expect from 2|Beans…..and now you can have your chocolate and your Fazzino too! 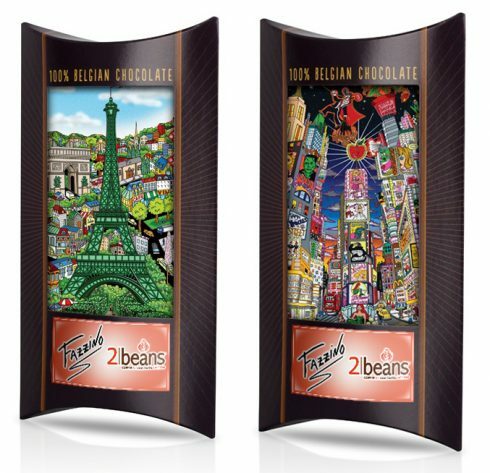 Charles Fazzino and 2|Beans are proud to announce a new alliance to present gourmet chocolate in a whole new way….as artistic canvas. 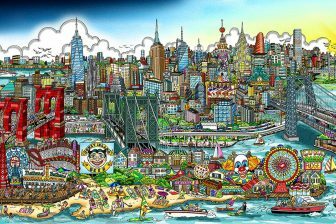 The gourmet shop has released a new line of products featuring a series of exclusively designed images by Fazzino. 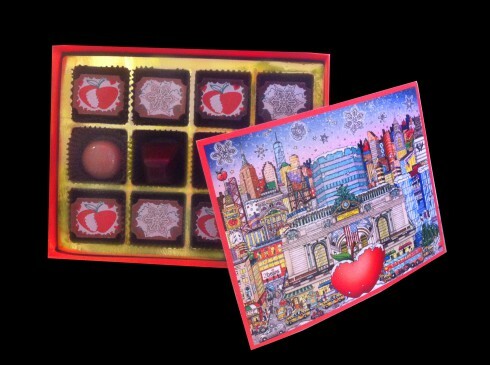 The collection is highlighted by a limited edition collectors gift box featuring Fazzino’s artwork inside and out, and a very special selection of Fazzino-stenciled pralines/bon bons, all produced by New York based gourmet chocolatier Chocolate Moderne. The 12 piece box of pralines sells for $55 and the 24-piece box sells for $90. 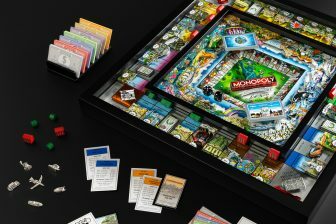 Each comes with a removable Fazzino fine art print (suitable for framing) inside the box. The second product in the line is an series of 4 ounce photographic chocolate bars featuring some of Fazzino’s most popular 3D art releases printed right onto the white chocolate. Each bar sells for $15.99. 2|Beans is located at 100 Park Avenue in New York City, right outside of Grand Central Station. 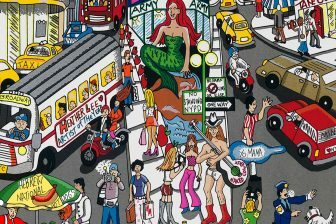 Make sure you stop in if you’re in the neighborhood…and tell ’em Charles Fazzino sent you. Enjoy!